I first studied art at Bishop Otter College in Chichester in 1971 when I focused on sculpture, working in a variety of materials. Painting was then my second discipline. I graduated in 1975 with Honours and went on to work in silver and jewellery design. I started painting again in 2001 working with oils on canvas. 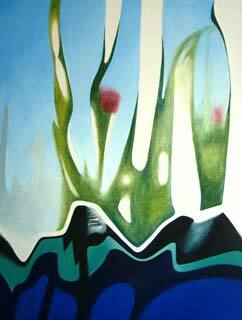 My inspiration was primarily distorted light seen for example through textured glass or reflected in water. I aimed to capture those fleeting moments which only one person would otherwise see. No two people can see anything from the same perspective. Every image is changed by the light and the position from which it is seen. I was working solely from my own photographs which I take with a digital camera. These paintings are worked freehand with conventional brushes and a limited palette. In 2010 I embarked on a series of short courses at West Dean College completing a Foundation Diploma in 2011. This has revived my interest in mixed media work and changed the direction of my painting and drawing which has taken on more of an expressive manner. If you are interested in any of the paintings shown here please contact me. Some are available for purchase or exhibition. Prices range from £100 - £500.